Daughter number one wanted one too so here it is. Top is a slab of Camphor Laurel which is book matched and joined with biscuits. For the legs I just went for a walk in the bush and found a great long piece of old hardwood which worked very nicely. Tops of the legs have been shaped to fit holes drilled with a 1 and 1/4” Forstner bit and wedged. I also glued the the legs with a new product I am trying (pictured) which is quite amazing, excess goes to a foam and comes off easily, holding strength is amazing, waterproof, VERY quick dry time; seems great so far. My Nephew recommended it to me and he is a cabinet maker who uses it regularly. Finish is Scandinavian oil and I will put a couple of coats of wax on the top also. My daughter is a primary teacher and intends using it in her class for the children to sit on when they have their ‘news day’. I like the rustic legs. A real nice stool David, sure us rustic, Daughter will love it. 1. Where did you get the glue from? I found a NZ supplier but that was the closest. 2. Is that Astro turf I see? as nobody has grass that green at the moment. 3. What is the connection between icemanhank and David? 4. Did you use the Structan on the seat edge too? My Nephew got it for me so I don’t really know where it came from, he said he can get me some more for $15 a tube from where he works. I saw the Kiwi supplier when I looked it up too. No it’s real grass mate and yep the mower needs to come out of the shed! My last name is henry and hence the Hank part and I guess I don’t show a lot of emotion, or so my wife tells me. 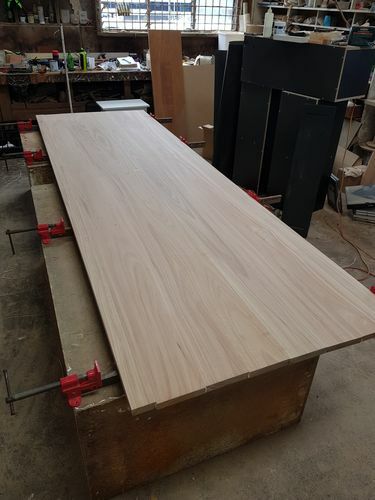 Here is a pic of a Blackbutt table top he used it on. A very nice stool. I like the natural look on the legs. Keep doing whay your doing …its a winner!